It's been just over a year since I stopped working due to medical issues with my pregnancy. It's been almost a year since the baby, Bailey, has been born. It's time to start planning her birthday party. What do you plan for a one year old? This time just two years ago, my house was completely ready for Christmas. The tree was up. Presents were wrapped and ready. Santa's bag was ready to be filled with gifts for my stepdaughter who was due for a long visit for Christmas. This time just last year, even on bedrest...the tree was up, decorated...my house was ready for Santa and to make a 3 year old little girl very happy. This year. I have a wreathe on my door that I ordered from my nephew's Boy Scout fundraiser. If he hadn't of asked, the cabin would have nothing Chrsitmas related. I just can't get motivated to decorate knowing I just have to take it all down within the month. Add the stress of keeping a teething baby out of the tree and I just want to cancel Christmas. This year I also started quilting for others as a business of sorts. 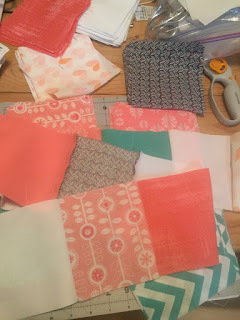 I have one quilt due before Christmas and I'm still piecing it together. It's going to be amazing and it's going to be done on time...The lady who ordered the quilt actually purchased most of the fabric and sent it to me to make the quilt. She did not have enough fabric for me to make it, so I have added some additional fabric of solid colors to match. I have about 20% of the piecing done and it's actually starting to look great! I'm very excited to send this one off when it's finished. I can see it coming together. I'll have to add a picture of the work in progress. I don't want to show too much of it off in case the one who ordered it finds this blog. I want it to be a surprise. An awesome and amazing surprise! So as I begin my life as a new stay at home mom, who finally feels recovered enough from havings of a newborn...I want to invite you to follow me through my charmed cabin life adventures.